A year later and I haven't made any progress on liking the master bedroom. I used to be on a yellow and grey kick, but while I was working to finish the fireplace room and my DIY Pottery Barn knockoff mirror, I had a new revelation. Dark blue walls in the master bedroom. I put together this inspiration board with the thought that the room should be both pretty and functional (i.e. sleep-inducing!). Blue walls in the bedroom = relaxing! I had to work around a few constraints for my board. Specifically, I might be vampire. When I sleep, it has to be d.a.r.k. dark. So, the walls needed to be some kind of dark light-absorbing color and the white Ikea curtains I lined with blackout material should remain. Also, I'm not changing out the carpet. It's the same beige carpet that graces our floors on the entire second floor of our house (all of the bedrooms). And last, we own a bunch of matchy-matchy dark wood pieces similar to the nightstand you see below, including headboard, pair of nightstands, dresser, and chest of drawers. For the sake of not spending an arm and a leg, those stay safe - for now! I have an idea to "slipcover" my headboard to change it up a bit. For paint color, I'd choose something like Benjamin Moore Hale Navy, Vermont Slate, or Bella Blue. All in all, I was going for a put-together, natural, and collected look. 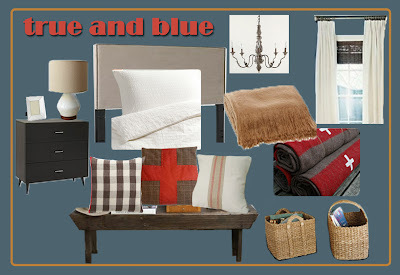 My favorite parts of this inspiration board are the swiss army blankets, bench (which I intend to DIY), and rope (incorporated through a lamp or some kind of accessory). It just gives me that warm and cozy feeling -- this is the type of bedroom I want to wake up in! I'm loving the mood board. I really want to paint my bedroom a moody blue like that. And I love that upholstered headboard.